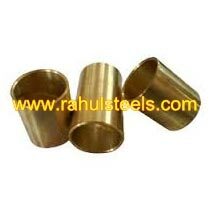 We are one of the leading manufacturers and suppliers of a supreme quality array of Brass Bush. This Brass Bush is fabricated using superior quality raw material in compliance with international standards, in our world class production facility. It is stringently tested on various parameters to ensure its flawlessness. Offered bush is available in various specifications to the clients and at rock-bottom prices.